Brady Mark Leffler is a musician hailing from a tiny town in the heartland of America, West Point, Nebraska. His momma made him take piano lessons from a very young age, just like his other siblings. Then came the moment he picked up his first electric guitar before hitting his teens. The KISS bug had bitten him at about age 11, and it was all over from there. Rock and roll all night, and party every day. Encouraged to take band class in Junior High, he, of course, chose the most ‘rock N’ roll’ instrument his teacher had to offer: the drums, which he studied and played through high school. He even dove into performing in musicals, and singing in the school’s church choir through graduating high school. During all of this, an obsession with all things music were bubbling out of his head. 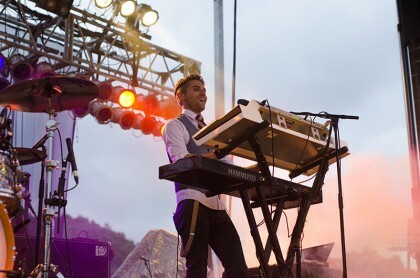 He got his start with touring at the age of 19 as a synth player in a Phoenix, AZ based band. Then swinging both ways in the music camp, he also sought out work as a crew guy, running bands’ merchandise and also as a back-line tech. Anything to get him on the road, deep in the belly of where a huge part of music’s inspiration lies. This led him to a gig as the tech for We are the Fury, a glam rock n’ roll band under the management of the legendary Doc McGhee, which eventually led him to taking over duties on keys from the original player. He then found his way, from the band’s home in Ohio, out to sunny Los Angeles. Through friends of friends, his eyes were opened up to the world of being a ‘hired gun’ musician. This allowed him to freely dive deep into playing in a variety of different bands on different levels in various musical styles ranging from pop, rock n’ roll, r&b and country. That early love for rock and roll has had a huge impact on his life in music. It carries through in his love for the absolute best instruments money can buy, or that one can find. This love goes back to the classics such as the great electric pianos, Hammond organs, acoustic pianos, analog synthesizers, and notably newer instruments like the Hammond SK-1, a new beast from a legendary instrument company that channels that good old soul both physically and sonically. Brady currently plays and tours the world with RCA’s Hot Chelle Rae , LA-based Americana group Gold Star , and also LA-based rock and roll group the Reflections under the management of the late Miles Davis’ son Erin Davis, as well as backing various other solo acts.